A small house site located about 325 feet (100 m.) southeast of Casa Rinconada and along the Casa Rinconada trail, Bc 59 was excavated in 1947 as part of the University of New Mexico/School of American Research field school. 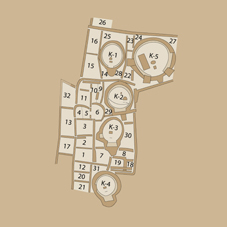 The site includes approximately 30 masonry rooms and five kivas. The excavators also noted a “refuse heap” east-southeast of the original site mound with skeletal material eroding out of it. Student notes document limited excavations in this mound and a later report by Erik Reed reveals that 38 individuals were recovered from 34 burials. In addition, Hyde Expedition photographs reveal that Pepper’s Burial Mound No. 1 was about 100 feet (30 m.) south of the Bc 59 roomblock. Pepper recovered 12 burials from the mound and his report also indicates that Richard Wetherill and the Palmer family excavated in the same area in 1895. Initial excavations revealed two-thirds of the site – including 13 rooms and three kivas. Continued excavations ultimately revealed around 30 rooms and five kivas. Many of the rooms at Bc 59 were irregularly shaped compared to the other small house sites in the immediate vicinity. This site is visible along the Casa Rinconada trail. Four tree-ring dates from a handful of beams recovered in Kiva 2 indicate harvest dates from A.D. 1050-1110. The dominant ceramic types are consistent with construction in the last half of the 11th century and the first half of the 12th century. Frequencies of other ceramic types also suggest the possibility of an earlier, 10th century occupation. Alternate designations for this site are 29SJ399, LA 40399, and Tom Matthew’s Dig. 1947: Excavated by Thomas Mathews, Gordon Vivian and the University of New Mexico/School of American Research field school.